amantes sunt amentes: Monkeys and Camels and Elephants... Oh My!!! By the time our train pulled into Jaipur, the official taxi stand was closed, so we had to select a driver from the myriad of offers that quickly besieged us outside the station. We settled on an unusually tall Indian youth around 18 with long greasy hair, a budding moustache, and a smirk of youthful arrogance. He was a good looking kid charging us very little to take us to our hotel in the hopes that we would utilize his services over the next couple days. Although a completely different character from Afsar, we agreed. We stayed at the hotel Udain Bhawan which was a cute Rajasthani-styled hotel designed to look like an Indian palace. We were a little nervous at the quality of the hotel (having been fairly lucky thus far) and our hopes sank further after having to step over a swathed body sleeping on the floor of the dark lobby in order to check in. The night manager was in a fight with one of the staff and both were yelling at each other and slamming doors huffily as we waited patiently for our room. They didn't have our reserved room, so they upgraded us to a suite which turned out to be lovely including marble tiled floors, a four poster wooden bed, and a bathtub big enough for five. We were ecstatic and enjoyed a night of luxurious sleep before being downgraded to a regular room, which was still nicer than expected. The hotel also had a lovely open air breakfast on top of the hotel with delicious masala tea and fresh juices. The next day we met our swarthy young driver with a vague idea of what we wanted to do in the city. He seemed more than willing to make suggestions and decided we would go see a temple nearby called Moti Dungri (meaning Hill of Pearls) of which we were unfamiliar, but happy to see. We drove through the city listening to bad Western techno mixed with Bollywood singing and rounded a busy intersection only to promptly get pulled over by the police. They asked our driver to step out of the car and talk to them as we looked out the back window nervously. More officers arrived to confront our driver gesturing toward us occasionally. After about 15 minutes he came to the car meekly asking for money to help bribe the cops. The whole incident seemed fishy to me -- was this kid too young to drive? didn't have a driver's license? wasn't supposed to be taking tourists around the city? Jean gave him some cash and he chalked the incident up to a corrupt police force, but I had my suspicions. We arrived at Moti Dungri, a white marble temple, named so because it looks like a little drop of pearl in the middle of the city. It's a small temple dedicated to Lord Ganesh overlooked on a hill by a Scottish-styled castle that belonged to the son of Maharaja Madho Singh and still occupied by the descendants of the royal family. After, we drove to the banks of a lake past painted elephants and camels to look at the Jai Mahal, an abandoned palace cooled in the summer naturally by the lake water underneath. Jean wanted to look at some jewelry so we went to a nearby shop that our driver recommended. 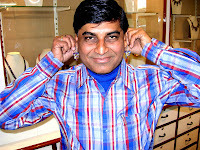 As Agra is famous for its marble, Jaipur is known for the quality of its jewelry and textiles. We spent a couple hours looking at lovely rings, bracelets, and necklaces that ranged anywhere from $15 to $15,000 dollars. I bought a few pairs of earrings and Jean bought a ring. After, the jeweler read our auras. Mine is apparently a light blue color and both my throat and heart chokras were blocked spelling doom for my relationships. Unfortunately, no amount of yoga could unblock these chokras, my only recourse being to wear a ruby amulet that, coincidentally, the jewelry shop could provide me at a good price. After, we drove outside of the city to the Amber Fort which is one of the most spectacular forts in all of India. Originally built by the Meenas, the fort and palaces within were conceived by the commander in chief of Akbar's army in 1592 and modified by successive rulers over the next 150 years. 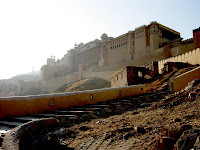 The Amber fort was initially a palace within the Jaigarh Fort situated on a hillside above and connected through fortified passages. 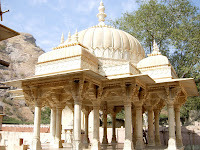 Jaigarh is built of red sandstone and white marble and provides amazing views of Maotha Lake and Jaipur. The Amber Fort, itself, is a sprawling structure in which we got lost several times. It has dark, narrow passageways smelling of urine and dizzying towers providing overhead views of the fort's courtyards. Inside is a hall that strategically placed thousands of tiny mirrors throughout so that when royalty walked into the hall at night with a single candle it would illuminate the entire hall. Monkeys played on the outskirts of the walls sunning themselves and eating local vegetation. Our guide dropped us off at Niro's, a popular tourist restaurant, where we had Alu Piaz (potatoes with anise cooked Rajasthani style) and Panir Korma (cottage cheese cooked in a cream-based gravy) while we prepared to see the old city in Jaipur the next day.